Beautiful Boutique Loft In Prime King West, Located Across The Trendy Thompson Hotel. Steps From Restaurants, Nightlife And Waterfront. 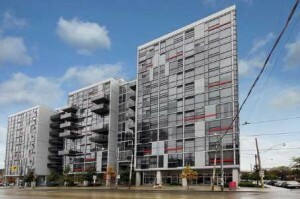 Modern Open Concept Bright Unit Facing East With City Views. Maple Hardwood Throughout. 10’Ft Ceilings And Floor To Ceiling Windows. Concrete Walls On Each Side. Kitchen Features S/S Appliances,Gas Stove, Granite Countertop And Modern Cabinetry. Low Maintenance Fees! 1 bedroom, 1 bathroom, with 1 parking space.